Dennis is crying out to remain in his position. Please, Mayor-to-be, get rid of him. More than half of the city of New York teachers want him gone. Parents who do not have time to read all the blogs and attend meetings of the Panel For Educational Policy (PEP) still know that something is wrong with the system itself, when good teachers disappear, abusive principals dont disappear, and there are whispers of cheating, uncontrolled bullying and yes, even physical abuse of students without any accountability. The new schools are failing, and teachers are leaving in haste - or being thrown out for no reason, with the help of the UFT and their "legal" partners, NYSUT. And yet, we still see the stupidity of Dennis Walcott and his PR Team in his writing about his management of $24.8 billion in public money. The Panel For Educational Policy is a puppet show, and the purpose is to 'approve' of the DOE policies and then they can say that "we", the public, "voted" on this huge amount in support of Bloomberg and Walcott. Kind of a slimey way to get there. Below, is a statement with Dennis Walcott's name attached (I'm sure that he did not author it alone or at all) published by the NY POST on Friday, September 6, 2013, concerning the disastrous NYC school system he and Mike Bloomberg "fixed" (yes, you can take that literally) over the past 11 years. Some intern even dug up a handy picture of a police car in front of a school, to make his point. The picture above evidently was taken in 2004, after police and school-safety officers responded to an incident at Adlai Stevenson HS in The Bronx. 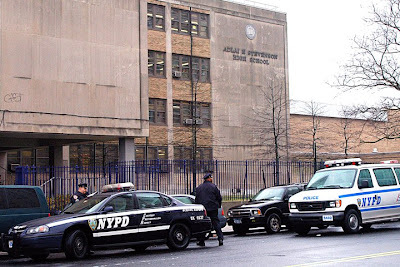 Dennis says, in this article, that "At Adlai Stevenson HS in The Bronx, gang fights in the late '90's were so common that teachers regularly pulled down iron gates from the hallway ceilings to contain rioting. The only way to protect students was to make them prisoners of their own school." What I see as a parent, a parent and employee/labor advocate, is bottom feeders called "legal" permitting lying, cheating, bullying and misconduct by "chosen" perpetrators (friends of DOE personnel with benefits, especially political connections) who are never held accountable or who are given minor slaps on the wrists if caught. And then he writes, "...These schools' culture of failure...needed to be reconceived...And that's what we did. After extensive community input...."
See what I mean? This makes no sense, saying it would be a dangerous policy to allow community approval, yet Dennis got 'extensive community input' from where? Ah, Dennis, how soon you forget. I spoke to one of your classmates from your middle school, and she told me you were bullied all the time, to the point of being ostracized from the class. Still bitter? I recently found myself absorbed in “The Ungovernable City,” Vincent Cannato’s extraordinary account of New York in the Lindsay years. He paints a vivid picture of a school system spiraling out of control. At Samuel J. Tilden HS in Brooklyn, 2,000 students had to be evacuated in 1969 after a student threw a Molotov cocktail through a window. A year later, the school was closed again when students set off stink bombs in the cafeteria and assaulted police officers. In retrospect, it’s hard to believe how long New Yorkers put up with that unconscionable situation. Yet the schools were only beginning their nosedive. In 1986, the old Board of Education began to keep graduation-rate statistics. It found that fewer than half the city’s students were graduating in four years. For the next 15 years, the number barely budged. Thirty years after the riots in its cafeteria, Tilden HS still endured a culture of violence and academic failure. Many students regularly carried guns and knives. 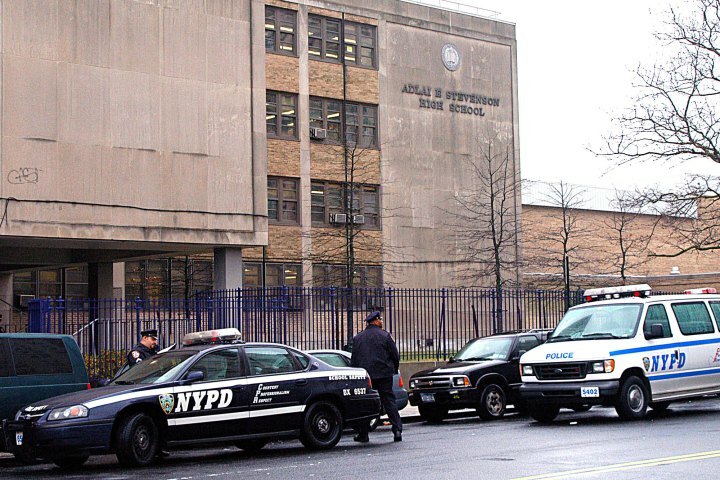 At Adlai Stevenson HS in The Bronx, gang fights in the late ’90s were so common that teachers regularly pulled down iron gates from the hallway ceilings to contain rioting. The only way to protect students was to make them prisoners of their own school. Not surprisingly, the school was steeped in failure in other ways as well. Only one in three students there graduated on time — and many never did. The students forced to attend these schools had no alternative to walking through dangerous hallways. No choice but to endure what was likely an inferior education, judging by the numbers. And a maze of union contracts and byzantine laws and regulations prevented parents from doing anything about it. They were all but prohibited from sending their kids to high schools outside of their districts. The gates were closed around them. Those parents and students didn’t know there could be another way. Because for decades, there wasn’t one. The forces of self-interest had made sure of that. Not because they didn’t care about children, but because they cared more about themselves, or the people who signed their paychecks or the ones who got them their jobs. It’s especially worth reflecting on this during an election year. Whoever sets the city’s education agenda for the next four years had best recall how bad things once were — and how easy it would be to relive the disasters of the past. There are powerful adults whose control over our students’ education was loosened when Michael Bloomberg became mayor. They’re now vying to regain their grip. On behalf of our 1.1 million New York City students — two of them, my grandchildren — I want to make sure we’re all aware of what’s at stake. No critic, candidate or union chief will be honest enough to say that they want to return the system to the old status quo. But if you listen carefully, you’ll hear euphemisms for some very bad ideas. Unions, activists and the candidates they support have been calling for moratoriums on replacing failing schools with smaller schools and charters. Some call for community approval before the Department of Education can act. But what would have happened if that had been the policy all along? In 2002, the graduation rate at 22 of the city’s large high schools was 38 percent. Some had graduation rates under 25 percent. These schools’ culture of failure stretched back years and even decades. They had defied a catalog of remediation strategies. They needed to be reconceived. And that’s what we did. After extensive community input, we phased each one out and replaced it with a collection of small schools specializing in everything from architecture to zoology. All employees at the old schools had to re-apply for their jobs, with principals placed in charge of re-hiring. The teachers union didn’t like it, but for the students and families who attended the new schools, it was a brand new day. Today, the culture on those 22 campuses has changed dramatically. The average graduation rate rose from 38 percent in 2002 to 68 percent last year. Schools characterized by chaos and failure stretching back to the ’60s have been re-born. At Brooklyn’s once-beleaguered Samuel J. Tilden HS, the graduation rate rose from 42 percent in 2002 to 78 percent last year. The dropout rate has fallen by half, and crime is down 93 percent. What would have happened if we hadn’t revamped Tilden HS? Where would those students be today? Think of that when you hear someone call for community approval of school phase-outs, for limits on new charters or for moratoriums on co-locating small schools in a building. According to MDRC, a widely-respected national research group, students who attend our new small schools have graduation rates 10 points higher than their peers at other schools. Better still, graduation rates for black males are almost 14 points higher at our small schools. We’ve significantly reduced the racial achievement gap in these schools — and found a model for success that has eluded America’s school systems for generations. At schools across the city, we’ve raised the gates that once imprisoned our students. Dennis M. Walcott is the city’s schools chancellor. Adapted from his speech this week to the Association for a Better New York.